upper layer of the skin and the layers below. This fluid cushions the tissue underneath, protecting it from further damage and allowing it to heal. caused by constant rubbing of shoes or clothing. 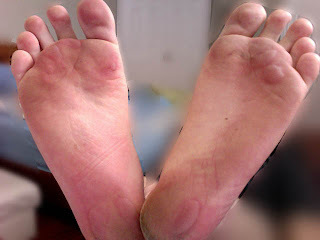 Extreme Temperature (Hot or Cold)- caused by sun burns or frostbite. Chemical- caused by solvents, cosmetics, chemicals, reaction to insect bites, etc. Crushing or Pinching- caused by hitting or pinching skin with tools or other objects, etc. Disease- caused by chicken pox, herpes, eczema, cutaneous radiation syndrome,etc. Make a hole at the edge of blister. Use a sterilized needle or pin (Pin/needle sterilized by passing over flame). Drain the accumulated fluid Keeping the skin intact to prevent infection. ointment. Cover with adhesive bandage for small blisters. Use porous, bandage for large ones. Do not puncture blister if painless; Do not puncture a blood-filled blister. Blisters disappear in a few days time. Diabetics should consult doctor.